I would like to welcome my newest sponsor, Southern Fabric. Southern Fabric has great precuts, and new arrivals sections. 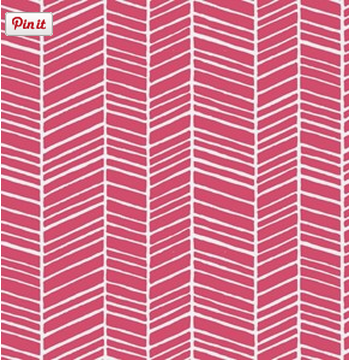 They also have my favorite True Colors print, Joel Dewberry's pink herringbone, and it's on sale! 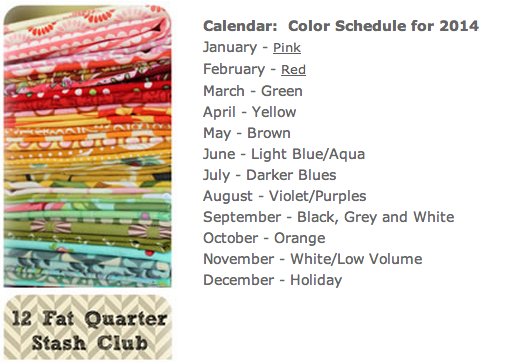 If you are looking to bulk up your stash with a great variety of colors, Southern Fabrics offers a Fat Quarter Stash Club with a fat quarter bundle of fabrics sent out in different colors each month. Their sale section has some deep discounts, up to 50% off, so if you like a good bargain like I do this is definitely worth checking out. Southern Fabric has generously offered to giveaway a $25 gift certificate to one lucky commenter. To enter the giveaway just leave me a comment letting me know what you would use it for. 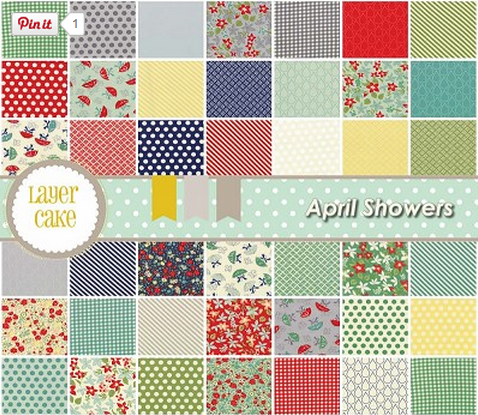 I would love to get my hands on an April Showers layer cake from Bonnie and Camille. The giveaway will end on Friday evening. Thanks for entering! Oooh, April Showers looks beautiful. I think that's what I'd get. I wonder if being the first one to comment will be lucky for me? Thanks for the chance to win. oh yes!! I would love April showers too! or Color me happy by V and Co! thank you for the chance to win!! I would use it towards any polka dot or chevron prints. Thanks for the chance to win! It appears we have the same favorite fabric designers :) I would pick up some Aviary 2 in lilac plus a bit from April Showers. I have been wanting some pieces from Color me Happy. That is where I would start my shopping. I like Janet Clare's first fabric line! I'd use it to round out my stash. I'm low on certain colors, like purples. Love the new Wishes by Sweetwater. But I love it all! There's a couple things in the sale section I've had my eye on for awhile!! I could really use some greens in my stash! I love Southern Fabric. They have such wonderful fabrics and I love their sales! I am always on the lookout for solids and tone on tones...thanks for the giveaway! I would get a jelly roll of chance of flowers! I'd love to get some Funky Monkey! Those bananas are awesome! I'd love to use it toward an Apple Jack fat quarter bundle. I love Color Me Happy and also am intrigued by this fat quarter club! I'd stock up on some True Colors. Thanks for the chance! I would buy a Noteworthy layer cake. Fun!!! I need to stock up on some orange and grey fabrics, I am low on both of those. I love the Josephine by French General Layer Cake! Beautiful. i really want some true colors woodgrains. especially the purple! That Herringbone print is one of my absolute favorites from the Modern Meadow line - I am so happy they re-released it under the True Colors :) Generous giveaway!! I'm looking to add some solids or tone-on-tones to my stash. Thanks for the chance to win. I would pick bluebird park, either yardage or a layer cake. I think that line is so cute! I think I'd use it on a layer cake of Hubba Hubba by Me & My Sister. It looks like such a cute collection! I would love some Color Me Happy! Thanks! Great give-away! I'd use towards a Potluck Layer Cake. I think I'd get some Bluebird Park - love that line! V and co or some solids. I'm an April Showers lover too! Thanks for the chance to win! I think I would go for some tone on tones. Thanks for the chance. I have a project in mind that I'm thinking of using April Showers for - maybe mixed with Happy Go Lucky. I would love some more of the True Colors collections. I'd get a FQ bundle of Simply Color. Thanks. I'd have to choose between V & Co. Color Me Happy or True Colors. Thanks for the chance to win! wow, fabric! I would touch it, rub it, hold it and it would tell me what it wants! I like the True Colors woodgrain. I would buy some V@ Co fabric! I really want some of the April Showers fabric too. I've got a couple of projects in mind for my living room. I would like to get Day Dream or April showers or .... Thanks for the chance! Love & cameo charm packs...both on sale right now too! I would like to purchase more fabrics to add to my stash. At the moment, I am thinking about making a few pillowcases. Thank you for a chance to win! Definitely some True Colors. Or I'd save it and get me some new Lotta Jansdotter when it comes out! April Showers would be a great selection, Erica! I would also love some True Colors. Thanks for the great giveaway! I need to increase my purple stash after making a wedding quilt for my cousin last year. Thanks for the opportunity! I've been meaning to get Happy Go Lucky for months. I should finally do that! I would love to get some DS fabric, or some low volume fabrics. THank you for the awesome giveaway! I have shopped with them a few times before. I'm loving those polka dots in April Showers. Thanks! I'd get some Bell Solid yardarge! Honestly, I'd love to cut into some April Showers too, even though I am enjoying the snow right now. Thanks for the giveaway chance! I would love to get Storybook to make a great baby quilt. Thank you for the chance to win! I've been waiting for April Showeres since I saw all her quilts from market. I just bought Camille's book Simply Retro, and every project in the book would look great with it. I would put it towards Daydreams by Kate Spain. I'm building my stash so think I would go for some Bella solids. Thanks for the chance! I have to have the Simply Style FQ bundle. It is to die for! Daydream would be my choice... Thanks for the chance! I would love anything Lario! A Sphere layer cake would be my choice. True colors. Love them! . Oh my goodness. It's so hard to choose with so many great fabric lines out there. I'd like to get some fabrics from the Aviary Granite line because they'd work great for a project that I'm slowly working on. I would like to have Pot Luck layer cake. I would definitely get something in the April Showers line...maybe even put it toward a fat eighth or quarter bundle! Even though I'd be on the waiting list for this, I'd choose to buy:Heirloom Citrine - Fat Quarter Bundle (9) by Joel Dewberry for Free Spirit...so pretty! I would love some Scrumptious fabric! I would use it toward Daydreams by Kate Spain. I love True Colors by Joel Dewberry! I would use the $25 voucher towards six yards of backing for my Museum Medallion quilt! Definitely April Showers! Love those blues in there. Thanks! As much as I love the April Showers fabric, my stash is seriously lacking in solids, so I think I'd go that direction. Thanks for the giveaway! I'd buy the Round and Round pattern by Thimblblossoms and fabrics, maybe from the Sphere collection by Zen Chic. Thanks for the giveaway! It would be used for a lovely stack of True Colors! I would love April showers also! I would definitely buy bluebird park! I love that line :) thanks! I would love to get some Happy Go Lucky! Thank you for sharing! I would love to get the Giggles Layer Cake!! They have such wonderful fabrics. Thanks for the chance! I would use it for getting some yellow colored fabric for a quilt for my new daughter-in-law. Hmmm... they have so much to choose from. I think Id try to shop the sale section for some backing for a quilt Im working on. My stash could use some more low volume, purples, and I can never get enough text prints! Thanks for the opportunity! I would get more low volume. I tend to gravitate towards loud and colorful. I'd get a fat quarter bundle for a quilt. Thanks! I love the April Showers . . . but may have to build my solids stash! I would get the April showers bundle. Thanks for the inspiration and giveaway! I would love some Sweetwater Wishes! And I am always looking to add to my stash and there are so many great choices in the sale and scrap packs!!! I've had my eye on the Effie and Ollie Elephant pattern for some time. So I'd pick that and then some fancy prints to sew them. I think April Showers is the perfect choice....love the umbrella quilt by Camille! Kate Spain Daydreams for me. It's just delicious. I see they have some older Amy Butler - love those Lotus dots! Do people from Europe have their chance as well? I would buy some stash builders and stock up on sale yardage for quilt backings! Running low on a few things! true colors is totally calling my name! Love them,, especially the ones by Joel Dewberry! Thanks for the chance! I would probably pick up either Aviary 2 or Simply Style. I would get London and Salt Air scrap bags. Thanks! I'd pick up some Moda Charm Packs, or solids! Thanks! I would love to have that April showers fabric! Or I would like some stash builders. Ooh, that could take me days to decide. Taza by Dena Designs is beautiful. . . I'd love to get some road 15 yardage. I can't get enough! So many choices! I would definitely get some purples or blues! Anything from True Colours is amazing - such a great collection! I'm a newbie & have a huge stash of really vintage fabric(from my g-grandma)& I need to find some new frbic to tie it all together. April Showers would be my choice, too! Thanks for the chance to win. April Showers of course!! I love this new fabric line. My birthday is in April & it just speaks to me!! Thanks for the opportunity to enter!! I quite like the black, grey, and white fabrics in Joel Dewberry's True Colors line. I think they would be a great addition in my stash. I would. Choose some yardage of Happy Go Lucky. Thanks for the great giveaway. My choice would be some Avalon yardage. Thanks for the chance to win! I love so many but the True Colors fabrics are calling to me. Love that April Showers- so sweet. Very pretty fabric--I think I would do some modern flowers. I would love to have a bundle of Storybook by Kate and Birdie. Such sweet prints. Thanks for the chance to win! I'd also love some April Showers. Such a cute line! I would buy some additional fabric for my block of the month stars. Unlike you, mine are not yet finished for last year, or started for this year. I like the my sunshine layer cake by Riley Blake. I'm needing to get some red, white and blue fabrics for an upcoming project for the 4th of July. I would get some Good Morning fabric I've been wanting for a while! Thanks for a chance. I would get a Mirabelle layer cake or jelly roll! I love all fabric but right now I could use the Riley Blake Cotton Stars. Well, I love me some Joel dewberry or Tula pink ;) thanks for the giveaway! I really like the neon chevron bundles. Pairing that with a good neutral just speaks to me! The Bluebird Park layer cake is looking pretty good. I would like to try the True Color Fabrics after seeing all the inspirations. I think I'd go for a couple of soho chic charm packs. I could certainly use a new spring runner for my coffee table. Thanks for the chance. I would love to buy fabric to make a purse or a wallet! I would definitely make a quilt with that cute April Showers. Maybe a churn dash or wheel block. I would pick out some true colors prints. I would add some Scrumptious to my stash. Can't get enough of those tiny prints. The curtains are wonderful...the print will grow on the husband, and he will be happy that the sun is blocked! I would love a couple Heirloom prints for some totes!